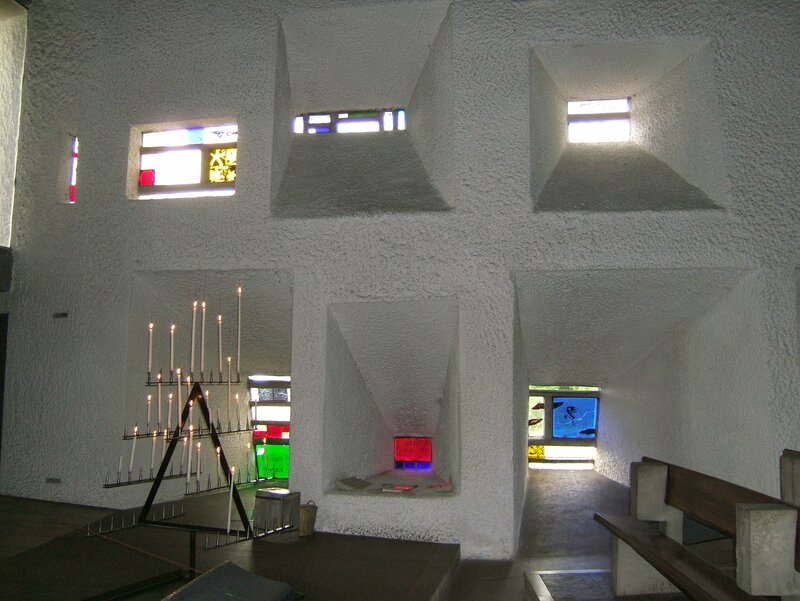 A stained glass window in the Chapel of Notre Dame du Haut in Ronchamp, France, designed by Swiss-born French architect Le Corbusier was smashed to smithereens in a break-in last month. On the night of January 17th, a person or persons broke through the stained glass window, hand-painted with a yellow flower, dark red clouds and the moon on a blue background, and stole a heavy concrete collection box from inside the church. The box contained no money; it was torn open and abandoned on the chapel grounds. The door leading to the library and gift shop also shows the tell-tale signs of attempted forced entry. Initial reports described the damage as irreparable, but all the glass fragments that could be found have been collected in two large bags and sent to master glassmaker Pierre-Alain Parot in Côte d’Or. Parot has restored some of the most exquisite stained glass windows in the world, including those in the Strasbourg Cathedral and is scheduled to begin work on the windows of Sainte Chapelle in Paris shortly. Despite his workshop’s undeniable skill, the job is a daunting one. When the thieves broke through, it busted into thousands of tiny pieces. The bad news is this is doubtless going to be a very costly, time-consuming rescue mission, and the decision about how far to go in the attempt is in the hands of the private owners of the chapel, the Association de l’Oeuvre Notre Dame du Haut. 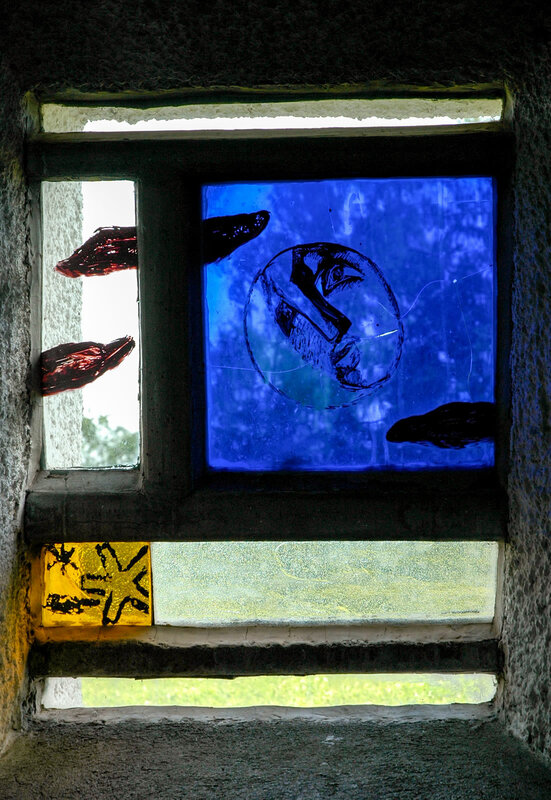 The master glassmaker and experts from the Regional Directorate of Cultural Affairs (DRAC) will first have to determine just how much of the window they think is salvageable and then present their conclusions to the Association. At the very least, this process will give experts the chance to study paint and glass samples, identify microorganisms or environmental issues at risk of damaging the paint, and determine what approach would be the most effective in conserving the surviving windows. This disaster has put the Association de l’Oeuvre Notre Dame du Haut’s record of securing and maintaining the chapel under the microscope. 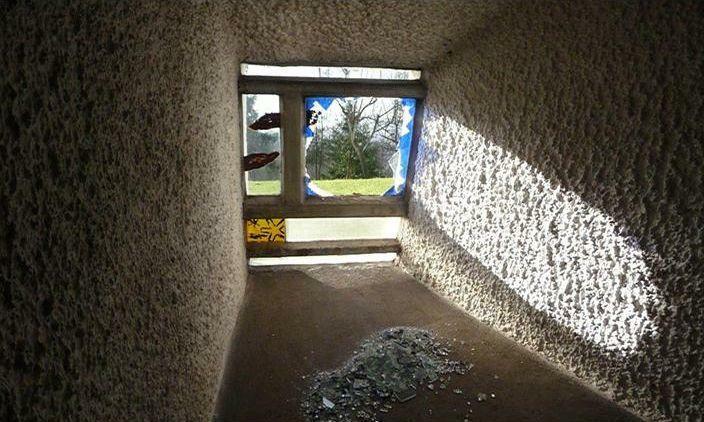 The Le Corbusier Foundation in Paris, an organization founded by the architect himself to ensure the conservation of his work, is displeased, to say the very least. The chapel is afflicted with moisture problems and serious damage to the concrete and masonry. While upkeep on the 60-year-old building is neglected, the Association chose to spend €10 million ($13,522,000) on a Renzo Piano-designed monastery built into the hillside next to the chapel. Boasting housing units for the Poor Clare sisters, an oratory for pilgrims, a large new visitor’s center, the new addition was completed in 2011. The Association de l’Oeuvre de Notre-Dame du Haut which owns and runs the site has done little to preserve the Chapel itself which is quite literally falling apart, with the white pebbledash cracked and crumbling away and the bare concrete eroding at the edges. Given the huge sums paid for the Piano project and the income from roughly 80,000 tourist tickets a year, this is scandalous, as is the failure to guarantee security. The building urgently needs restoration. The Association is therefore going to be under heavy scrutiny for their response to this violation. The Chapel of Notre Dame du Haut was a center of religious pilgrimage long before it was a center of architectural pilgrimage. The hilltop was a sacred space at least as far back as the Romans. The first Christian chapel was built on the site in the 4th century. The second chapel was destroyed during World War II. 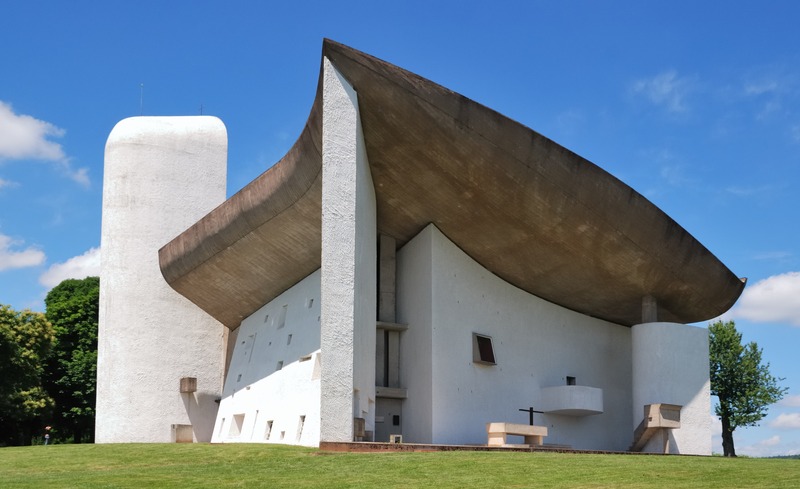 When the Catholic Church decided to rebuild after the war, reformers enlisted Le Corbusier to create a modernist spiritual space, a clean break from the decadent associations of the past. Because access to the hilltop was a challenge, the architect had to build the chapel without the mechanical tools of construction that had become part of his trademark approach. Thus the modern building was constructed using wooden forms, cast concrete, steel reinforcement all done by hand. The chapel curvilinear shapes, thick walls and swooping roof are unlike anything else Le Corbusier made. Many consider it his masterpiece. Indeed, it was finished in 1954 and declared a national Historical Monument just 13 years later.